My friend Kat got married this past weekend and the little family and I made the trek over to the mainland to attend her wedding. I was only able to snap a few photos at the very start of the ceremony before I had to put the camera away or risk getting it damaged because of a very grumpy two year old. Sadly, I totally forgot that I even had the camera for the rest of the morning and had only remembered when Brett suggested that we take an impromptu family photo. 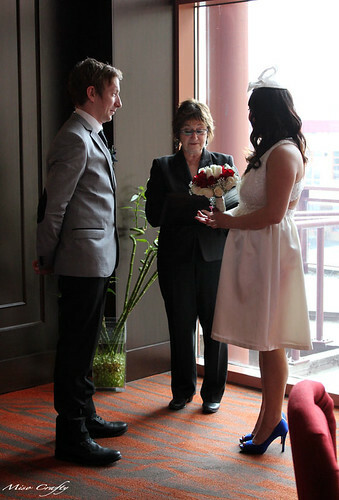 The wedding was absolutely lovely and very fitting of the newly married couple. It was small, intimate, sweet, and was all about sharing their love for each other with family and close friends. The whole ceremony and lunch was completely hassle-free, meaning the ceremony itself was short and to the point (no having to sit around while endless amounts of people recite poems, passages, and the like here! ), there was no unnecessary waiting around for everything (cause who likes to sit there and clap for an hour while every family member and friend that you don't even know is being thanked for showing up? ), and most importantly there was no weird awkwardness from having to sit at a table with a bunch of people you don't even know. If anything I saw people that I haven't seen in what feels like ages (and it probably has been!) and it was nice to be able to reconnect with old friends. As happy as I was for my friend and the new chapter she is about to embark in her life, it made me utterly sad to know just how much we've grown up and are slowly going our separate ways. The wedding helped me to realize just how much I missed her and the knowledge of knowing that she'll most likely move out of the country made me even more sad. My partner in crime is now a partner for life to somebody else! Not that we would be partying it up all night and hitting all of our usual spots like we did in the good ol' days (cause I seriously don't have the energy for all that any more!! ), but even the simple meal dates that we used to have (ahh...The Keg and Samurai) appears to be no more. So sad. Before I start bawling my eyes out, let's change the subject, shall we? In Victoria I rarely, if ever, get the chance to dress up. My day-to-day outfits are extremely boring and utterly utilitarian, but even if I do take the time to put on even a nice top or skirt the chances of it getting really dirty or damaged is inevitable. Every night before going to bed I can guarantee that the clothes I wore that day will have a food stain of sorts either on a shoulder or a thigh, sleeves will have been endlessly tugged at (the main cause for why some of my hand knit sweaters have stretched out and disfigured sleeve hems), a sticky spot will magically appear somewhere, and on numerous occasions I've even located a few shoe prints on a pant leg! I have to include the photo above. It was taken in the casino's parkade. I had just taken off my heels and was twirling for joy. Yeah...I'm weird like that. You look gorgeous! I love the cardi. It's a great colour on you. I loved your outfit! 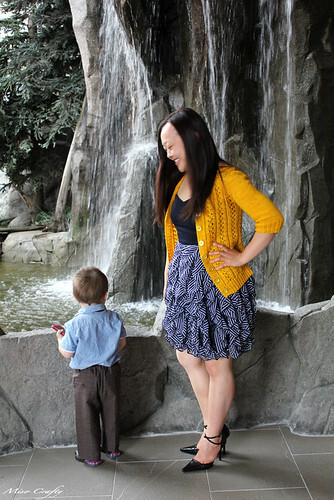 What is the name of the cardigan pattern? I also covet Kat's amazing blue shoes!!! Thanks! No, he didn't throw the phone into the water. I think he was too mesmerized by the waterfall to even move! Thank you! Lately I've been absolutely LOVING yellow. Thank you so much! 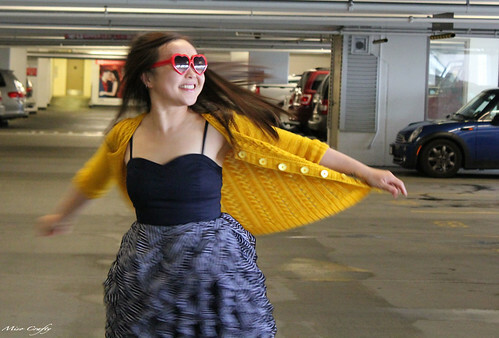 The cardigan is Honeybee Cardigan by Laura Chau.